How Moana uses Polynesian myths to create a Disney story. How Moana uses Polynesian culture to create a prototypical Disney story. 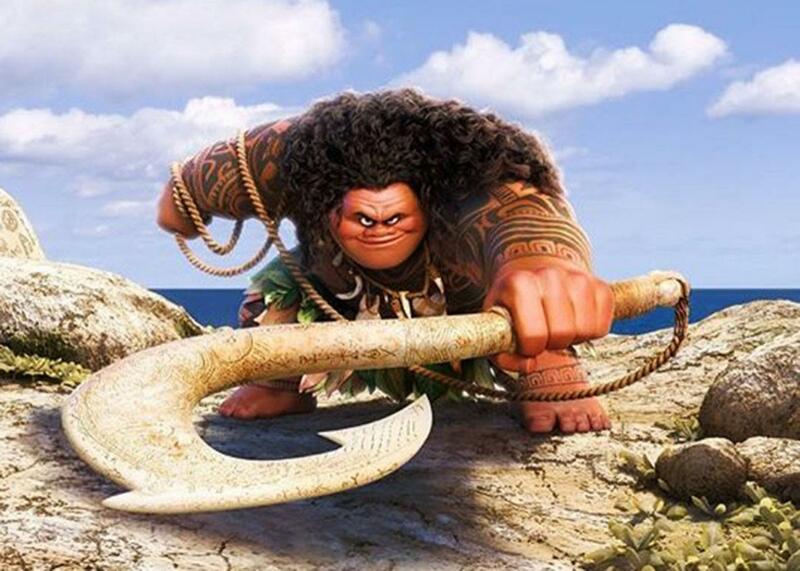 Dwayne Johnson as Maui in Moana. Aulani, a Disney Resort & Spa occupies 21 acres of oceanfront property on the leeward coast of the Hawaiian island of Oahu. A family-oriented but decidedly luxe vacation property—current rates for a standard room start around $500—it’s part of Ko Olina, a master-planned resort development whose other offerings include a Four Seasons hotel, a championship golf course, and four picture-perfect man-made lagoons. If that careful language rings a bell, it may be because you’ve overheard the conversation around Moana, Disney’s splashy new animated film, set in a nonspecific region of ancient Polynesia. A hero’s journey (and buddy flick and musical) that hinges on the pluck of a young woman and the powers of a mythical demigod, Moana has received a lot of attention specifically for its treatment of Pacific Islander heritage, language, and lore. Reactions have ranged from affronted to euphoric, with the most reasonable falling somewhere in between, along a scale of pragmatic ambivalence. From a certain angle, this latest big-budget entertainment merely amplifies the complicated interaction between culture and commerce that has long been a facet of Polynesian life, in all but the most remote corners of the South Pacific. The uproar preceded the film by months, sparked by the character design of Maui, the demigod, whose huge physical bulk was called out as culturally insensitive, hippolike, obese. Those complaints were partly quelled after some earnest explanation by the film’s creative team. Still, put it this way: Though he’s voiced by Dwayne “The Rock” Johnson and provides the liveliest spark in the film, Maui will be nobody’s idea of the Sexiest Man Alive. But this early pilikia (“trouble” in Hawaiian) has mostly dissolved in a frothy current as Moana has sailed toward its global release date Wednesday. As you’ve probably heard, the film was ethically sourced and painstakingly vetted: Its animators made multiple research trips around the South Pacific, forming the Oceanic Story Trust to provide close counsel. Auli’i Cravalho, the charming newcomer who plays Moana, is native Hawaiian. Johnson, who spent stretches of his youth in New Zealand and Hawaii, is half Samoan. Temuera Morrison, who plays Moana’s father, Chief Tui, is the dashing part-Maori actor who starred in Once Were Warriors. And in a sly bit of extras casting, “Villager #1” is voiced by Troy Polamalu, the former defensive dynamo for the Pittsburgh Steelers who’s of Samoan descent. Traditional Polynesian music is percussive and heavily chant-based, and Foa’i kept those elements strong in the mix, often with traditional instruments. But there naturally had to be accommodations for Miranda’s expositional patter and for the composerly bombast of Mark Mancina, whose other Disney credits include Tarzan and The Lion King. A song called “Where You Are,” early in the film, clearly bears the stamp of all three contributors. It’s a crash course in the utopian self-sufficiency of Motunui, Moana’s island home: “Consider the coconut!” her father prompts, and that wonderfully silly lyric unfolds a real truth about the resourcefulness of island life. But as Moana soon makes clear, in the anthem “How Far I’ll Go,” considering the coconut is of secondary concern, because her eye is trained on the horizon. Here is where you’ll probably start to detect parallels from elsewhere in the Disney canon: Moana is to Chief Tui as Ariel was to King Triton in The Little Mermaid. * She’s also a bit like Belle in Beauty and the Beast, with a worldly curiosity that sets her apart from the quotidian hum of her village. And as Slate’s Dan Kois has noted, there’s also the fact that Maui, like the Genie in Aladdin, is a shape-shifting wiseacre whose loyalty and magic are essential to the plot. All of these elements are rooted in archetype but have been subjected to a process not unlike gentrification. But look, that’s the price of doing business, just as it’s been for a hundred years or more in the South Pacific. This is a Disney movie. What else would you expect? The answer would be more cynical if not for the song “We Know the Way,” a rousing dramatization of the Polynesian tradition of exploration. The song begins with distant chanting and a rumble of drums, before Foa’i leads a chorus of voices in song. “Aue, aue,” they boom, in a harmonized mass. A moment later, Miranda takes over, singing in English of the intrepid ancient voyagers. On screen, the song accompanies a scene of those ancients proudly navigating the high seas in their outrigger canoes. As they pull on their ropes and judge the position of the stars, Miranda’s voice rings out: “We know who we are.” The surety of that declaration is a beacon for Moana, who finds herself literally adrift after leaving the insular comforts of home. For anyone familiar with Polynesian culture, it’s sure to be a stirring moment in the film. What it vividly calls to mind is the Hōkūleʻa, a large canoe launched by the Polynesian Voyaging Society in the mid-1970s, during a resurgence of interest in native history and traditions. It successfully sailed from Hawaii to Tahiti and back, using only ancient methods of navigation, and became an enormous source of cultural pride, then and since: It’s currently off the East Coast of North America, more than halfway through a three-year circumnavigation of the globe. In this context, “We know who we are” is more than a Disney bromide; it’s a poignant rallying cry. I thought of it when I read a recent Q-and-A with Cravalho in the travel section of the New York Times. At one point the interviewer asks, “How can tourists get to know the real Hawaiian culture instead of doing touristy things?” Cravalho’s reply is striking: “If I’m being completely honest, I have no idea. I know my culture, the deeper elements, but I don’t know where anyone could do that in just a trip. It isn’t something you just stop by and see.” Right—culture isn’t a costume or a line item on a checklist. It’s who you are. There is no grand nefarious villain in Moana. (Those pesky Kakamora don’t count.) The demonic volcanic monster Te Kā turns out to be an accursed form of Te Fiti, the mother island that Moana has been charged with saving. Maui inadvertently caused this ecological blight—“the darkness,” it’s vaguely called—when he stole Te Fiti’s gemstone “heart.” This is a flimsy plot contrivance, but it raises some intriguing questions about cause and effect. Western contact is nowhere to be seen in Moana, but then again, its premonitions are everywhere. Growing up on Oahu, I experienced native Hawaiian culture both as a way of life and as a product to be consumed. There were grade-school lessons in lauhala basket weaving and singsong chants to be recited during May Day pageants. There was traditional Hula Kahiko, which my little sister studied seriously for a while, entering competitions with her halau. But it didn’t escape my notice that the support structure for native Hawaiian culture, and the broader Pacific Islander culture, was often commercial, linked to the tourist economy. I saw a lot of hip-swiveling Tahitian dances and warriorlike Samoan slap and fire knife dances—whenever my parents took a mainland visitor to a luau or to a Vegas-style dinner revue like the Magic of Polynesia. Many island tour packages include a visit to the Polynesian Cultural Center, a theme park on Oahu’s north shore, owned not by Disney but rather the Church of Jesus Christ of Latter-day Saints—another institution with deep pockets, inscrutable governance, and a fastidiously wholesome image. That’s a lot of commoditization of local culture, but you could also call it the work of a corporate benefactor, if only for the employment and tourist income that the resort generates. Whatever your take, you have to admit one thing: The filmmakers and executives of Team Disney may seem to fumble their way forward at times, but they know who they are.